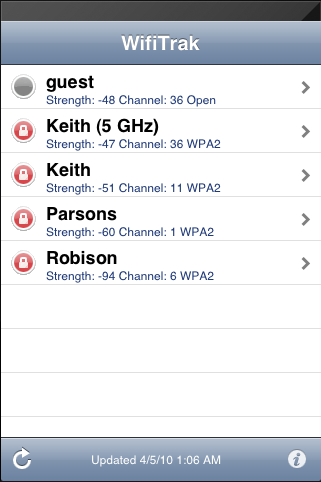 Comparing the RF, Bluetooth, and Wi-Fi between Apple’s Wi-Fi iPad and 3G iPad. In this blog and podcast I’ll be delving further into the radios included in the current two versions of Apple’s iPad. The results show the iPhone was strongest, followed by the Wi-Fi iPad and finally the 3G iPad. I was a bit surprised with these results. I had thought the 3G version, with it’s RF friendly plastic antenna cover near the top would have been better than the Wi-Fi only version. This test leaves a lot of variables, but it is still a fairly effective way of testing various RSSI of each device without actually attaching directly to the device in question. 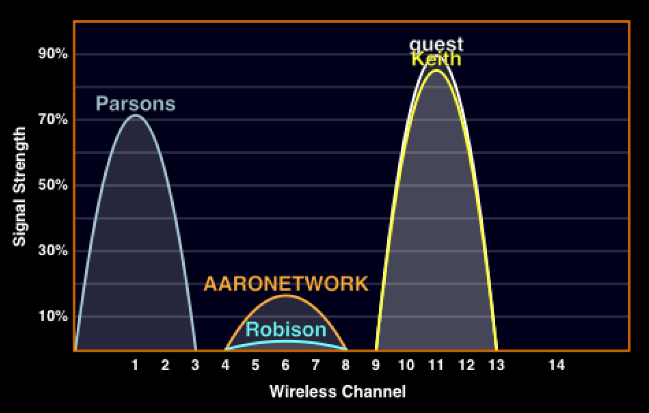 The next test used an AirMagnet Wi-Fi NIC and the AirMagnet Wi-Fi Analyzer software to report the RSSI of each device in dBm. As expected the AP came in fairly strong, and amazingly the MacBookPro was right up there. Followed by the portable clients, in the same order as before. 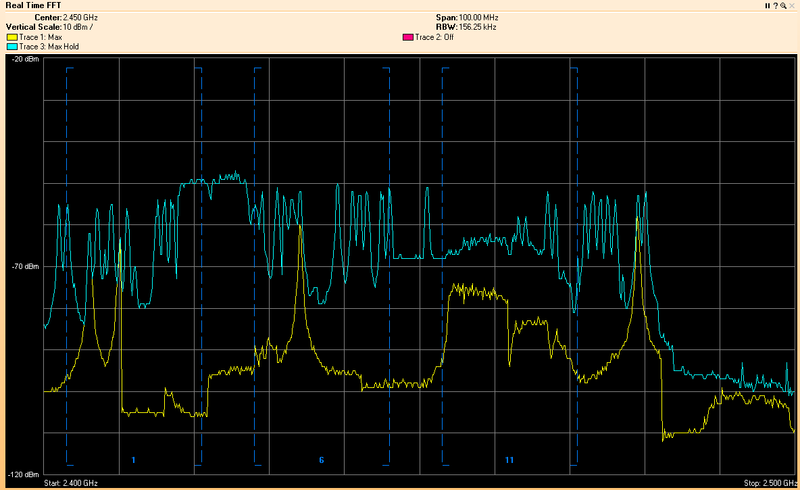 Again, using the AirMagnet Wi-Fi Analyzer, I looked at the decodes to see what various parameters the devices supported. 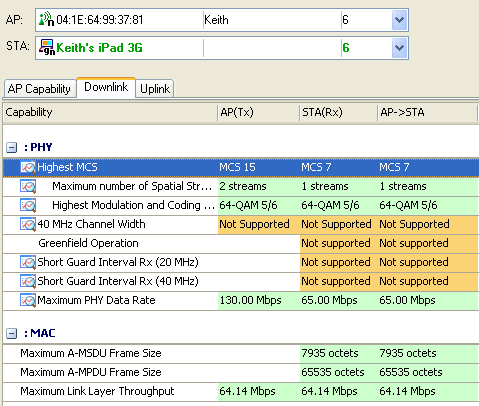 Both the Wi-Fi iPad and the 3G iPad supported the same 802.11n capabilities settings. They also both supported up to MCS index ‘7’. None of the other higher-level .11n features were enabled. 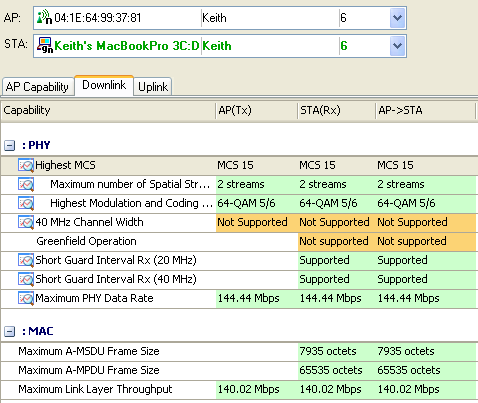 Using the .11n Efficiency tool in WFA, I next compared the supported data rates and capabilities between the MacBookPro and the 3G iPad. The MBP far exceeds the throughput capacity of the iPad. The laptop could, in the best of circumstances transmit a symmetric 140 Mbps, whereas the iPad could reach just under 65 Mbps. (mostly because of the differences between an MCS of 15 on the MBP and only an MCS of 7 on the single radio-chain in the iPad. Below is the capture of an iPad connecting to the Spring Overdrive. No one has ever applauded Apple’s wireless stacks. One of the other stated problems with iPads on a variety of campuses has been the problem with their processing of DHCP lease times. Laura Chappell has also done extensive analysis of the ‘chatty’ nature of Apple’s stacks, not only on iPhones and iPads, but on all their clients. (don’t get me started on Client firmware and drivers… all vendors do some weird stuff – all meeting 802.11 specs, but the specs have lots of ‘optional’ bits. For those of you who are into packet decodes, what type of authentication and encryption is being used in this exchange? 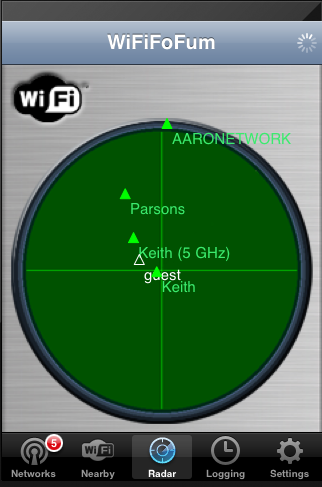 I had purposely picked up a 3G iPad on the assumption the radios would work better than the Wi-Fi version. I was surprised to find with the two I tested the Wi-Fi version reported slightly higher results in both Bluetooth and 802.11 signal strengths. I would still recommend the 3G version for the far superior GPS that is included onboard, as well as the capability to add a 3G signal (with a paid plan) in the future. I would think the update to the OS later this year to 4.0 version will also improve the Wi-Fi and other radio bits with patches/fixes that come as a vendor gets an extended ‘beta’ test. 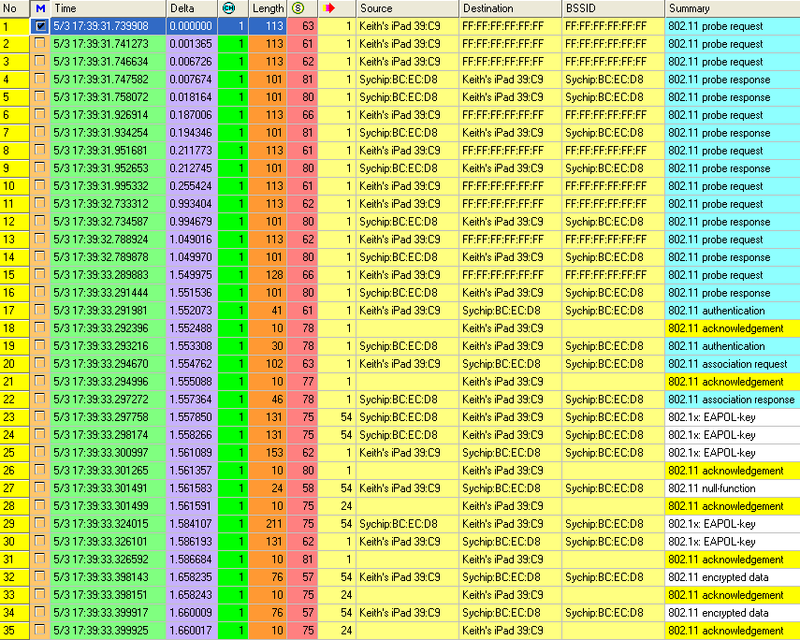 As of this posting Apple has already sold over 2 million iPads – that should give them a very large pool of ‘testers’ to help them better refine their firmware and algorithms for 802.11 connection and roaming in a future update. For now I’m still carrying my Spring Overdrive with me for 3G/4G Internet access that can be shared between all my devices. 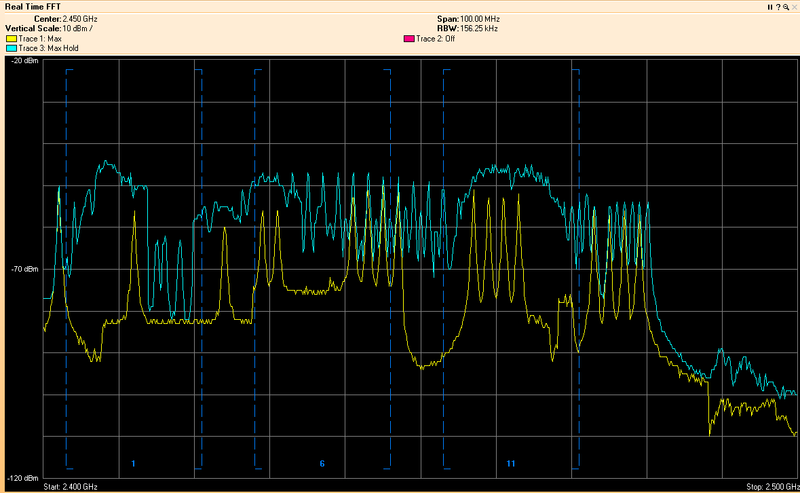 I personally haven’t found any issues with either of my iPads with respect to Wi-Fi and dropped signals. 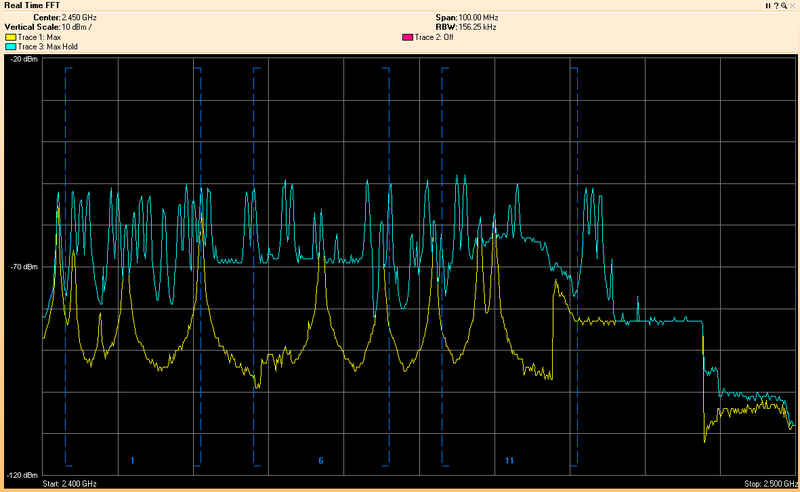 (knock on wood) – but I was already using the recommendations, separating 2.4 GHz and 5 GHz into different SSIDs. After having the iPads for many weeks of testing, I’m even more impressed with the technology. One easy way to sum up my iPad experience, of all those who might complain the iPad isn’t this, or isn’t that, or doesn’t support flash, or any of the many complaints… none of them actually owned an iPad! All those iPad owners I’ve communicated with are totally enamoured with the product and use it more than they ever expected. No, it won’t replace my laptop anytime soon, but it sure make a fantastic light-weight addition. It is wonderful for the consumption of media, from TV shows, to games, to technical PDFs, to staying up on RSS feeds, to reading/watching news, and finally it totally replaced my Kindle. I can’t recommend the iPad any higher. 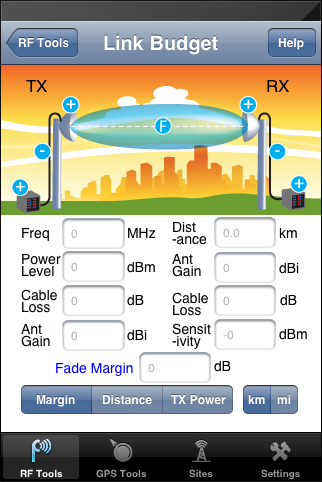 I am just waiting for Apple’s next developer code to support Wi-Fi analysis in the public infrastructure, http://www.wlanbook.com/iphone-wifi-scanner-apps-banned-by-apple/ then we’ll see some fantastic tools for the Wireless LAN Professional on this platform. 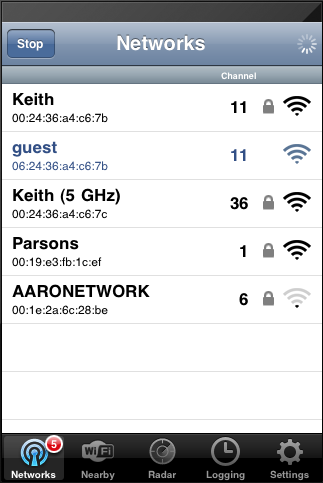 I’ve included a couple graphics from iPhone Wi-Fi apps that I happened to already have before the ban a couple months ago, so you can see what might be coming soon.